Click here to enter the 2010 event or prepay for additional festival tickets! 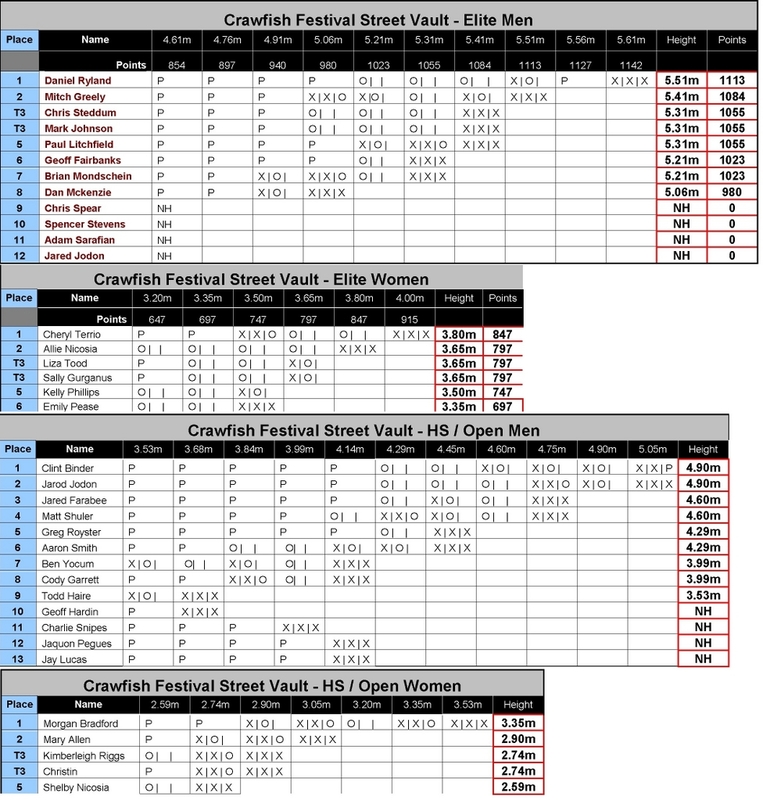 Click here to see the results of the 2009 Rosewood Crawfish Festival Street Vault!!! The scoring of the Elite Men's and Women's groups will be combined accordingly abiding by the IAAF Outdoor International Scoring Table; thus there will only be one First Place prize winner. We believe these start times will be accurate. However, because of the unique format of this event, it is possible if we have unforeseen delays, or finish a section early the times may adjust. Please come early for your section, we will not be able to wait on any vaulters. The list of entries will continue to be updated until the day of the meet. If you are planning to come and do not see your name on the start list please click to email Matt Carroll. Once you are placed in a section it will be final. If for some reason there is a change and you are moved into another section you will be notified before the event. A) There will be a limited number of poles for use. If you choose to borrow a pole from USC, the policy is you break you buy no exceptions. The university has been kind enough to let us use some of their poles and they must be replaced if broken. B) We will have a water cooler, but you should plan to bring your own hydration or buy it on site. C) There will be limited seating, you are recommended to bring your own folding chair if you will need one. D) This is South Carolina in May! Be prepared. We will have some shade and coverage with tents, but bring proper precautions and sunscreen. E) The entrance designated for the vault is at the corner of Rosewood Drive and Howard Street. You will not be able to drive straight up Rosewood all the way to the vault, you will have to enter the neighborhood on the right and drive down a side street to Howard. This will be a busy area please be careful as many vendors will be using this entrance to bring in food and ice. F) We will have storage for poles and would like every vaulter to bring their poles to our office storage space either Friday night between 6-9pm or Saturday morning anytime before 10:30am. The office space is located at 2758 Rosewood Drive (directly across from the All State Agency and Home Vestors Office). Please call my cell phone (713) 202-6061 and arrange for your drop off, I will be moving the runway and pits to the office during the time above both Friday evening and Saturday Morning. G) You may bring your poles on the day of the festival, but you must arrive with your poles no later than 10AM, as the side entry gates will be closed at 10AM and no poles will be allowed through the main entry gates. Also, parking will fill up very fast. The later you show up the longer distance you will be carrying your poles. You may visit www.RosewoodCrawfishFestival.com and use the mapping software, or follow the directions below. From I-26 take I-126 exit to Downtown Columbia. Stay to the left on I-126. Continue on and I-126 will become Elmwood Avenue. Get over to the right lane and after you go through a couple lights you come to Assembly Street, take a right onto Assembly. **Continue on Assembly through downtown and campus. Cross the train tracks and continue on until you see the fair grounds. Here you will reach Rosewood drive. Take a left onto Rosewood. Head up Rosewood about a mile and you will be at the Festival. Likely your best bet for parking will be in the neighborhood on the right side of Rosewood Drive. 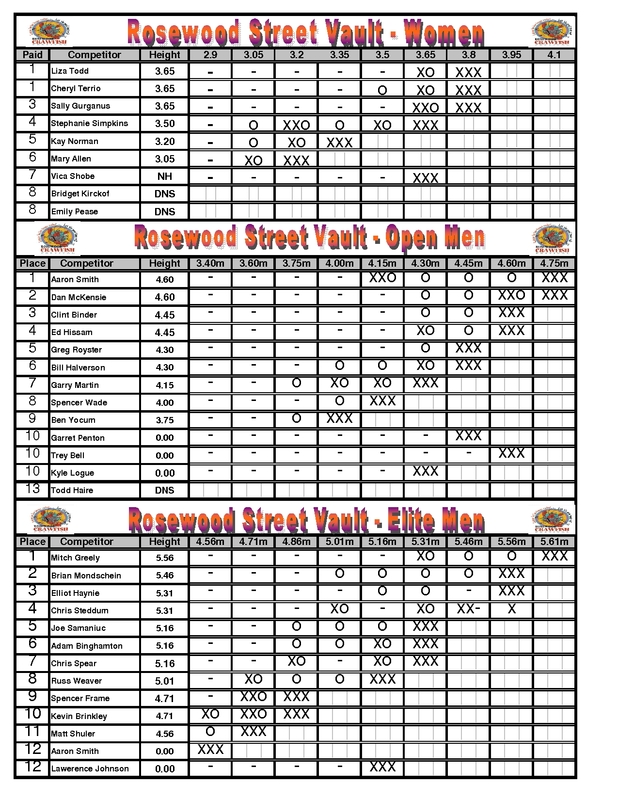 The entrance for the vault will be at Howard St, and Rosewood Drive. We should have someone stationed there to take you entry fee and give you your festival entry ticket. From I-77 take I-277 (about exit 17 I think) exit to Columbia. Follow I-277 and it will become Bull Street. Continue down Bull Street through 10-15 lights until reach Gervais Street. Take a right onto Gervais. Follow Gervais for a couple blocks until you reach Assembly street and take a left onto Assembly Street. Follow Directions from ** above to the street vault.